Those behind Nostalrius, an unofficial legacy version of World of Warcraft, say they will give their source code to another legacy project after BlizzCon 2016 came and went with no word from Blizzard on its intentions, if any, to bring out an official legacy version of the MMO. 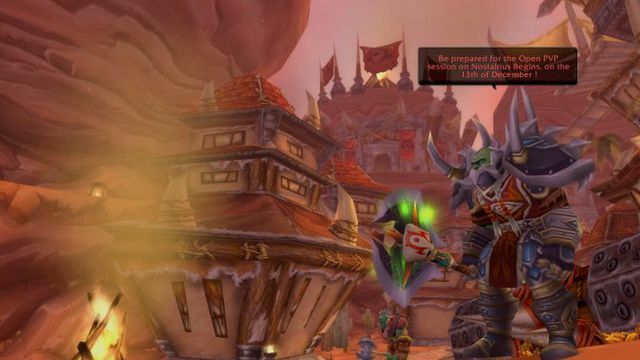 The release was detailed in a blog post by Nostalrius' administrator, who expressed frustration with a lack of communication from Blizzard several months after the two sides met and the publisher indicated some openness to supporting legacy editions. That meeting had sounded a positive tone about Blizzard's openness to legacy servers, and Nostalrius' administrator said their volunteers "were ready to work like hell" to help bring it about, so that it would not be burdensome to a Blizzard development team working on the officially supported version of World of Warcraft, whose latest expansion, Legion, launched at the end of August. "But we never received any response to these questions, even after four months," the administrator wrote. "Then, we tried to show our motivation to solve the issues from a different angle by working on mature proposals (studies, cost analysis, schedules, milestones, etc. ), including a complete transfer of technology of our existing work, fixing the few remaining issues we had, official Battle.Net integration on Legacy to enhance community driven strategy and other more complex IT topics, all of this on a volunteer basis." With no reply from Blizzard and official silence on legacy World of Warcraft coming from Blizzcon this weekend, "it's time for us to release our source code and additional tools to the community in the hope that it will maintain the Legacy community as much as possible until Blizzard announces an official Legacy plan," wrote Nostalrius' administrator, "should they decide to do that." The assets will be given to Elysium, another legacy project "which we believe to be the most in line with our values." Polygon has reached out to Blizzard for a comment on this development and its posture toward legacy editions of its games. While private servers such as Elysium and Nostalrius are against the MMO's terms of service, they do exist and remain online. Blizzard has taken action, citing its responsibility to protect its intellectual property, when they become too large to ignore; Nostalrius was World of Warcraft’s largest private server, with more than 800,000 registered accounts and a daily active user peak of 10,000, when it got the shutdown notice back in April. Shutting down a server involves sending a legal demand to the service providing it; this can be overseas in a different jurisdiction, meaning it's not as simple as Blizzard now noticing Elysium and forcing that down by mailing out the kind of cease-and-desist letter that has become a common threat to the fan development community. Nostalrius' developers say they will continue to collaborate with the Elysium volunteers but Elysium will be responsible for creating "the documentation required to install, understand and use the work we did." Once that is done, the source code and documentation will be released to the public. Nostalrius says the Elysium team "promised to not receive any profit from this activity."